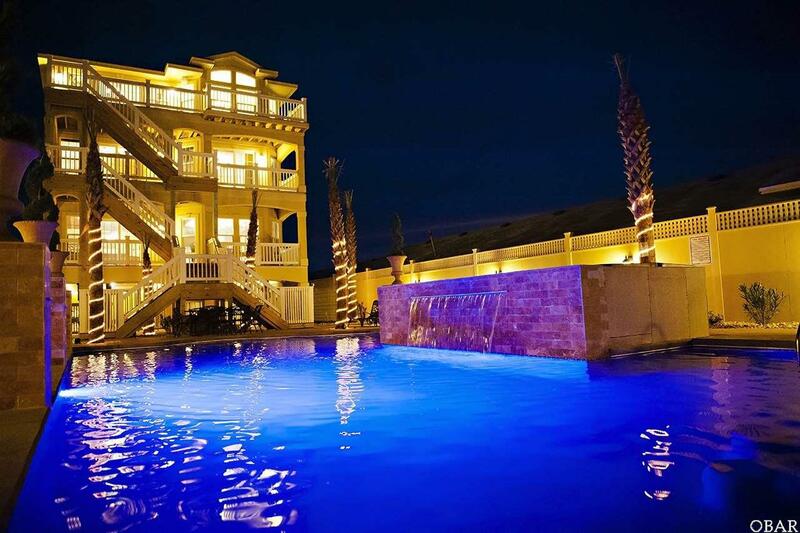 OCEANFRONT: Lane Five Star, Five Diamond, 18 Bedrooms (16 Master Suites), 18 Full Baths and 2 Half Baths, sleeps 44. This gracious four level Mediterranean design has unsurpassed panoramic views of the Atlantic Ocean. This palatial estate features an Extravagant Great Room, Regal Dining Rooms, State-of-the-Art Theater Room and Electronics throughout, Gentleman's Sports Bar, Recreation Room, Library, Sitting Room with Cappuccino/Coffee Bar, 50' Heated Infinity Pool with Beach Entry, 1080 sq.ft. Lane Signature Pool House with sauna and much, much more!!! Exquisitely appointed featuring Old World elegance and quality craftsmanship throughout, this estate home includes a marble foyer, custom iron balustrades, hand painted murals and endless ornate custom designed Italian marble. It is professionally decorated with the finest custom furnishings and it features state-of-the art electronics. Upon entering, you will find Italian Marble Flooring with custom mosaic inlays, Custom Designer Lighting, Exotic Bamboo Cane Treads and flooring, and Bronze and Gold Balusters. Hand-painted Columns with Corinthian Capitals and Arches at entryways guide you from room to room. You'll be stunned by the Gorgeous Custom touches and finishes; to include Hand-painted Murals, Custom Cabinetry, Solid Wood Stained panel Doors, Wall-mounted Touch Screen Electronic Controls, Tray, Barrel, Dome and Handcrafted Coffered Ceilings, Mahogany raised panel Wainscoting with three piece chair rail, Exotic Stone Countertops, Beautiful Expansive floor to ceiling Windows with exceptional detail, Priceless Hand-painted Mural throughout the Glass Elevator shaft, Three Fireplaces (one see-through) with Marble, Stone Finishes, Old World Finish, etc.. High end furnishings are found throughout the home; such as Ambella, Royal Patina; Stanley, Benetti's Italia, Highland House, Custom Luxury Handmade Silk bedding by renowned Ruby Collection, John Richard etc. Elegant Great Room features detailed arches and columns with Corinthian columns, custom lighting, original hand painted murals, fabulous oil paintings, gas fireplace, multiple sitting areas and gorgeous ocean views.Grande Regal Dining and the Fabulous Gourmet Kitchen include seating for forty-two. The Expansive gentleman's sports bar features coffered ceilings with a hand painted dome, mahogany paneled wainscoting, kitchenette with refrigerator, dishwasher, commercial icemaker, wine cooler, billiard table, game table, 3 Flat screen TVs, karaoke player and surround sound. Enclosed Sound Proof Grand Theater Room features 119" projection screen, with HD projector and Blu-ray DVD player, fiber optic twinkling star tray ceiling, reclining over-sized theater seating and Netflix. The Recreation Room is equipped with billiard table, foosball and 2 Flat screen TVs. Luxurious Exterior Living: A fabulous 30' x 36' Lane Signature pool house is equipped with a wet bar, icemaker, refrigerator, sauna, full bath, TV, iPod dock, custom stone gas fireplace, finished with limestone and travertine. The second level features two bedrooms, living room with sleeper sofa and full bath with pool side and oceanside decks. The third level is complimented with a travertine natural stone sundeck above. Escape to your own private walkway to the ocean. Enjoy the ambiance of the custom stone waterfall flowing into the sculpted underwater colored, LED lighted, 50x 24 pool with beach entry, swim-up bar, infinity edge, travertine fountain columns with urns and 2 built-in hot tubs with stone surround and poolside music and lush tropical landscaping filled with palm trees. Expansive Bar and game area under the house adds more outdoor living and entertainment. This property Generates income over $440,000 a year consistently. Property has large dune Previously known as “The Nub” where Professional Hangliders used this dune to teach classes and for recreational purposes. Current appraisal on file for 4.3M. Call agent about guaranteed rents.